The Institute of Geography and Spatial Organization of the Polish Academy of Sciences cordially invites you to participate in the conference on "Governing Urban Diversity", which will be held in Rotterdam on 8-10 February 2017. Read more … Conference "Governing Urban Diversity"
Conference "Governing social diversity in Warsaw - problems and prospects"
The Institute of Geography and Spatial Organization of the Polish Academy of Sciences, and the City of Warsaw cordially invites you to participate in the conference on "Governing social diversity in Warsaw - problems and prospects", which will be held in Warsaw on 14-15 May 2015. Read more … Conference "Governing social diversity in Warsaw - problems and prospects"
Institute of Geography and Spatial Organization PAS together with Ministry of Infrastructure and Development of the Republic of Poland and Polish Geographical Society invite on Warsaw Regional Forum 2015 - "Territorial uncertainty and vulnerability as a challenge for urban and regional policy" (14-16 October 2015, Warsaw). The IGU Commission on Tourism, Leisure and Global Change with the Institute of Geography and Spatial Organization PAS, Polish Geographical Society and GEOGRAPHIA POLONICA journal to organize the conference “Tourism and Transition in a Time of Change”. 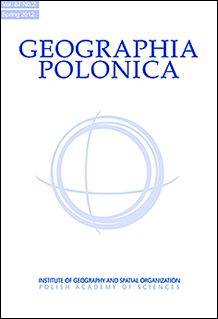 The Institute of Geography and Spatial Organization Polish Academy of Sciences is co-organising the thematic sessions of research papers during the IGU Regional Conference in Kraków, Poland, 18-22 August 2014.